The Mormon church says it will end its relationship with the Boy Scouts of America and will create a youth development program of its own. The Mormon church and the Boy Scouts of America have announced that they are ending their relationship, after more than 100 years of close ties. In a joint statement, The Church of Jesus Christ of Latter-day Saints and the Boy Scouts said that as the church's membership is increasingly living outside the United States, it "felt the need to create and implement a uniform youth leadership and development program that serves its members globally. In so doing, it will be necessary for the Church to discontinue its role as a chartered partner." The church said its new youth development program for both girls and boys will begin in 2020. Until then, "the intention of the Church is to remain a fully engaged partner in Scouting for boys and young men ages 8-13 and encourages all youth, families, and leaders to continue their active participation and financial support." The move is important because Mormons make up a major part of the Boy Scouts membership. The church has been the single biggest sponsor of Boy Scout troops in the U.S. The Associated Press reports that "Mormon boys who will be leaving represent about 18.5 percent of the 2.3 million youth in the organization." In a separate statement, the Boy Scouts of America said it is "confident that many LDS Scouting families will go on to enjoy Scouting for years to come. ... For LDS families who want to continue the tradition of Scouting beyond 2019, the BSA will ensure a smooth transition to community-sponsored units that will welcome youth previously served by LDS-sponsored units." The Mormon church has long used the Boy Scouts as its official program for young men, according to Quin Monson, a political science professor at Brigham Young University in Utah. "The church took the Boy Scout program and decided its values and mission aligned closely enough with that of the church's program for young men that they just wholesale adopted it," Monson told NPR in 2015. He is Mormon, and a former Boy Scout himself. "Basically, if you are a young Mormon male, you join the Boy Scouts," he said. 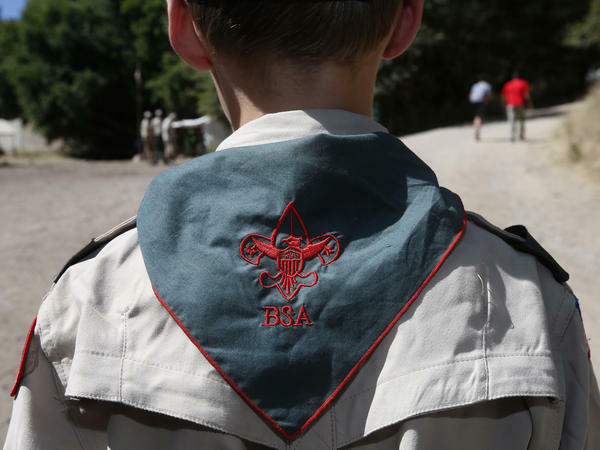 A year ago, the church said it would no longer participate in the Boy Scouts' programs for older teenagers, saying that in most of its U.S. and Canada congregations, "young men ages 14 to 18 are not being served well" by the BSA's programs. In 2015, the church said it was "deeply troubled" by the BSA's decision to lift its ban on openly gay troop leaders. But as the AP reports, it "stayed with the organization after receiving assurances it could appoint troop leaders according to its own religious and moral values." Last week, the Boy Scouts of America announced it was changing the name of its Boy Scouts program to Scouts BSA to reflect its decision to welcome girls. Some of its programs for older youths already allowed young women, but in October, the Boy Scouts said girls would be allowed to join Cub Scouts and was creating a program by which girls could pursue the rank of Eagle Scout.